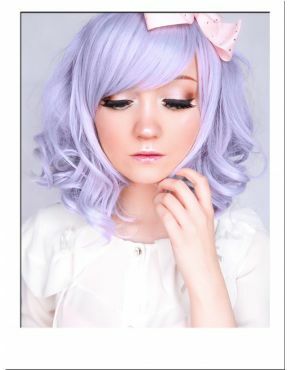 A bold and beautiful wig featuring tight curly hair lengths in a pretty shade of pastel baby blue. The straight, full fringe adds an edgy twist and can be trimmed to suit. The luxury synthetic fibre boasts an afro texture. Create incredible volume and a 'fluffy' look by separating the curls with your fingers or brushing through with a wide tooth comb. A gloriously photogenic wig, long enough to be styled and tied back, as pictured.